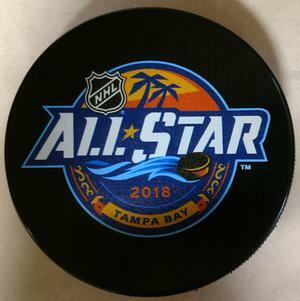 The 2018 National Hockey League All-Star Game took place at Amalie Arena in Tampa, home of the Tampa Bay Lightning on January 28, 2018. Tampa last held the NHL All-Star Game in 1999. The Pacific All-Stars won the All-Star Game, which was in its third straight year of a four-team, 3-on-3, single elimination format, with one team representing each of the league's four divisions. Rookie Brock Boeser of the Vancouver Canucks was named the Most Valuable Player, scoring two goals with an assist.